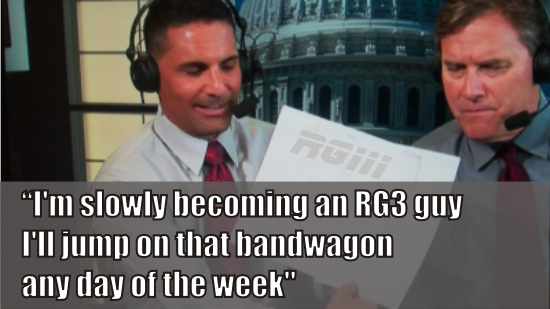 "I'm slowly becoming an RG3 guy, I'll jump on that bandwagon any day of the week"
DC Sports worlds are colliding! There is a lot of sports excitement in DC for the first time in forever and people are getting on the bandwagon of all the teams, even broadcasters ... well ... probably not the Wizards. It was Oakland vs. Cowboys, not the 49ers.